William Mulholland turned east to the Colorado River as a new source of water. He began a four-year series of surveys in 1923 to find an alignment that would bring the water of the Colorado River to Los Angeles. In 1925 the Department of Water and Power (DWP) was established and the voters of Los Angeles approved a $2 million bond issue to perform the engineering for the Colorado River Aqueduct. The DWP brought the cities of the region together with Los Angeles in 1928 to form a state special district. An act of the State Legislature created the Metropolitan Water District of Southern California (MWD). Its original purpose was to construct the Colorado River Aqueduct to supply supplemental water to Southern California. In 1931, voters approved a $220 million bond issue for construction, and work began on the ten-year project that would bring the water 300 miles to the coast. Part of the success of the project was the spectacular Boulder Canyon project, now known as Hoover Dam. The DWP, manager of its own hydroelectric power facilities along the Los Angeles Aqueduct, was instrumental in the struggle to gain federal approval for the project which combined flood control, water supply, and energy production for the three states that form the lower Colorado River basin. Los Angeles, as primary consumer of the power, guaranteed its power purchases against the federal government’s costs for the dam. Completed in 1935, the dam began furnishing power to the city the following year over a 226-mile transmission line built by the DWP. 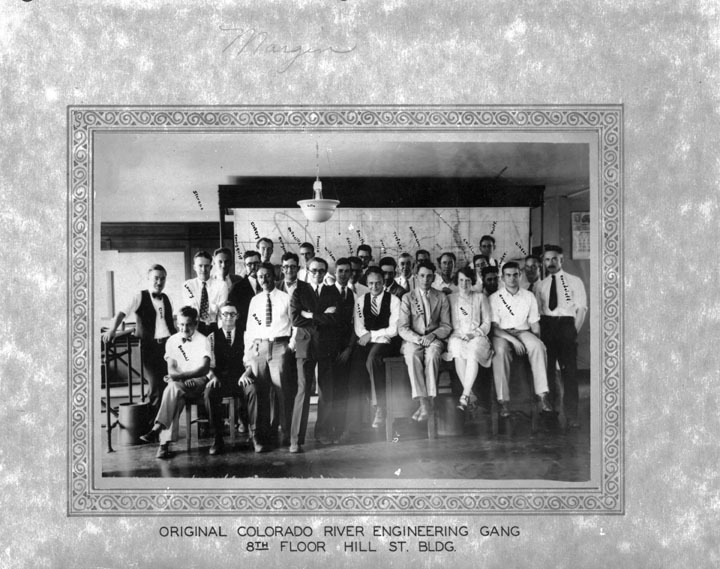 Upon the completion of the Colorado River Aqueduct in 1941, MWD began to wholesale Colorado River water to its member agencies. Today those agencies include 14 cities, 12 municipal water districts, and a county water authority. More than 130 municipalities and many unincorporated areas are served by this project of the DWP’s and Mulholland’s vision. Before his death on July 22, 1935, Mulholland lived to see the beginnings of the Colorado River Aqueduct and Hoover Dam, constructed in the spirit of greatness he had always envisioned for Los Angeles. (1931)*# – Map showing routing of the Colorado River Aqueduct. The MWD considered eight routes for the aqueduct. 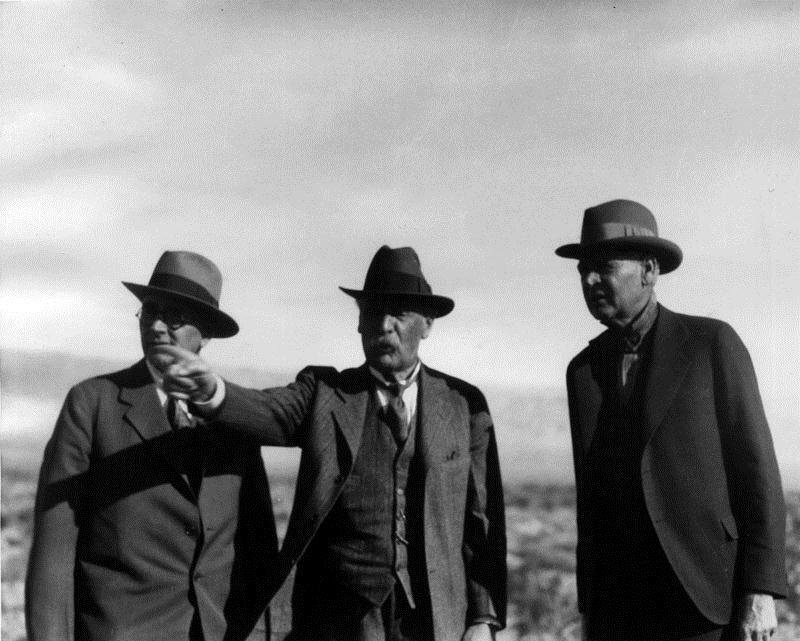 In 1931, the MWD board of directors chose the Parker route which would require the building of the Parker Dam. The Parker route was chosen because it was seen as the safest and most economical. A $220 million bond was approved on September 29, 1931. Work began in January 1933 near Thousand Palms, and in 1934 the United States Bureau of Reclamation began work on the Parker Dam. Construction of the aqueduct was finished in 1935. Water first flowed in the aqueduct on January 7, 1939. (ca. 1933)* - Empty reservoir on the Colorado Aqueduct. 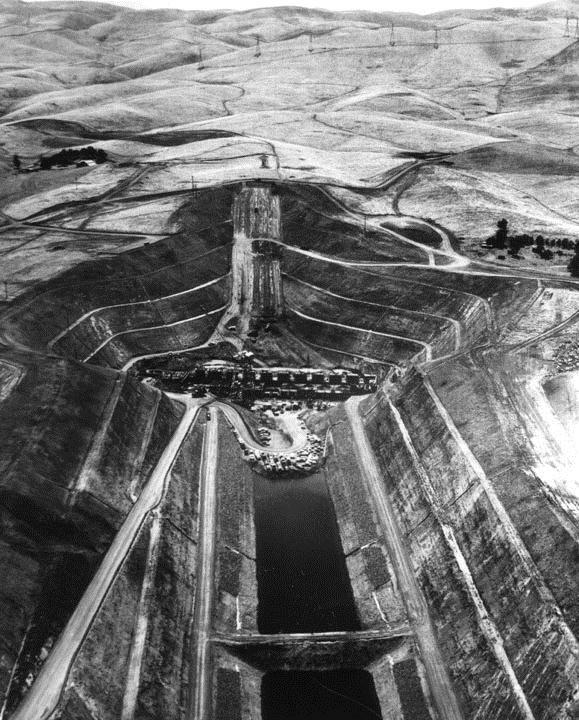 An aerial view of an empty Colorado River Aqueduct reservoir under construction in the 1930s. (ca. 1938)* - Colorado Aqueduct construction - The Colorado River Aqueduct, built 1935-1941 by the Metropolitan Water District (MWD). 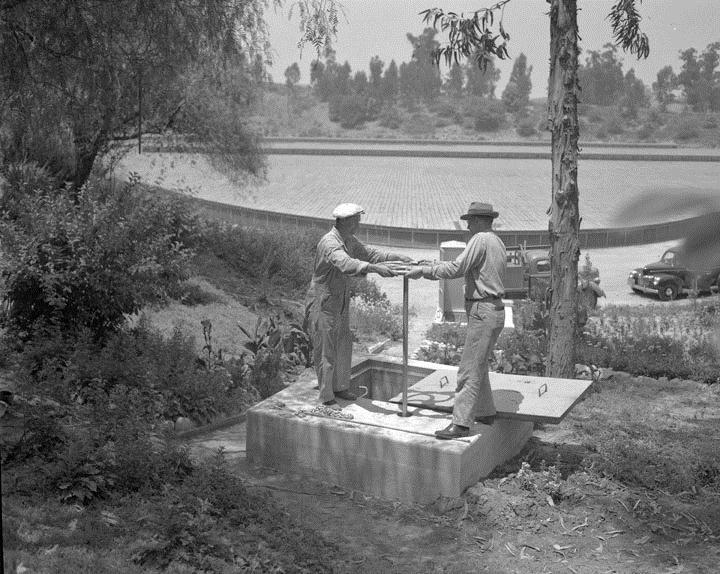 (June, 1941)* - Ellis Davey (MWD) and B. W. Weaver (DWP) turn 30" valve that lets the first Colorado River water into the city system - Ascot Reservoir. (1977)* - Caption Reads: "The MWD Colorado River Aqueduct is brimful now that it is operating at 20 per cent above design capacity". Photograph dated: June 23, 1977. 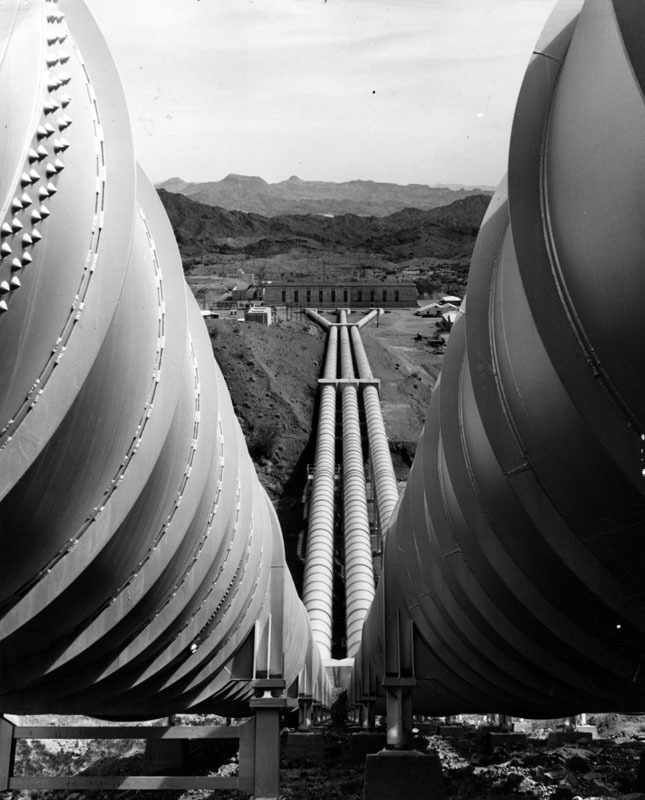 (1977)* - Photograph caption reads: "Like huge arms, giant pipes carry Colorado River water to Southern California from the Gene Pumping Plant on the Colorado River Aqueduct. The plant, second of five on the system, is located 3 miles east of the Colorado River". The Gene Pumping Plant is just south of Parker Dam and lifts the water 303 feet. 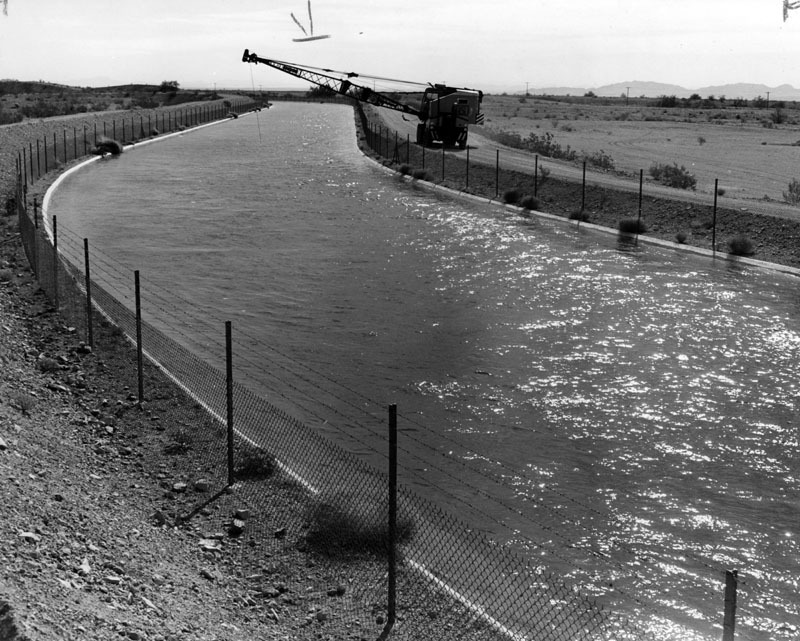 In 1955, the Colorado River Aqueduct was recognized by the American Society of Civil Engineers (ASCE) as one of the "Seven Engineering Wonders of American Engineering". 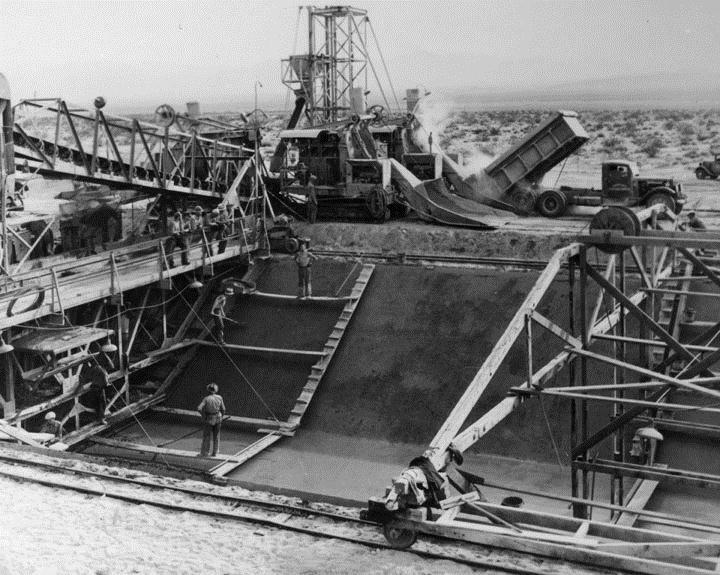 Click HERE to read 'Mulholland and the Colorado River Aqueduct' from LADWP's Historic Archive.